Creat better game recording experience in Filmora scrn. There are numbers of screen recording software tools in the market and each one of them offers unique features for gameplay. But it is quite difficult for gamers to choose the best one for their needs. It is better to check reviews first so that you can pick the best one. If you are also searching for the most suitable gamplay recording software then the article below will be useful for you. Here we are going to compare two most competitive platforms for gameplay recording: The Shadowplay and OBS. Keep reading to avail deep details. OBS: stands for Open Broadcaster Software tool that is available as open source and can be accessed for free from any corner of world. This tool is designed to serve users with advanced video recording abilities and it can also work for live streaming. You can download OBS easily from internet and launch it on Linux, Mac or Window platforms. This high performance software tool can handle all video and audio recording applications up to unlimited duration. Users can make easy switching between different transitions. There are lots of advanced filters for completing the major editing tasks like chroma keying, automatic color correction and image masking etc. You will find easy to use audio mixer along with pre-source filters that can work for gain, noise suppression etc. It is much easier to configure OBS and this task can be completed to beginners too. You can add different sources to this platform; duplicate the existing ones and make adjustments for their properties. ShadowPlay: is an advanced DVR style recording tool that works with Instant Replay Mode. Users can save the last 30 minute session by simply hitting the hotkey. Also, it allows direct media sharing to popular social media sites like Facebook, YouTube etc. This easy to use game recording software can capture game videos with 4K content quality and offers 60 fps rating for frames. This tool is hardware accelerated hence it runs automatically on the background as soon as you start playing any game on device. 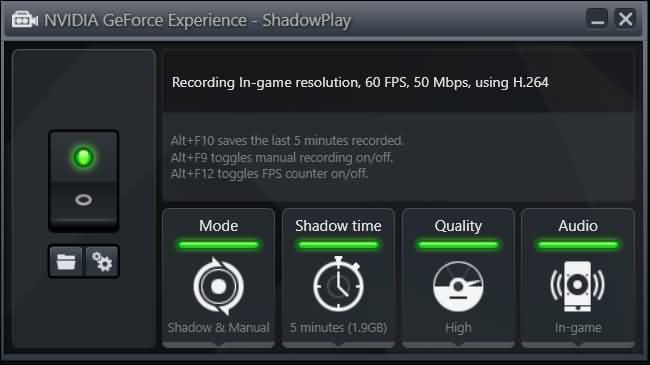 The best thing to know about ShadowPlay is that it does not affect system performance. Users can easily broadcast their games to Twitch, Facebook Live or YouTube live. It extends support to custom graphic overlays so that live streams can be easily customized. ShadowPlay assists in 4K recording. ShadowPlay does not affect CPU performance even while extending its support to higher framerates. On the other side OBS causes great effect on CPU performance even while working on limited frame rates. The great thing to know about OBS is that if you compress videos using this tool then there is no need to recompress them again while uploading on YouTube. The format stays in desired size and can be processed smoothly. But, ShadowPlay does limited compression hence file size stays larger and you need higher bandwidth rating to finish uploads. ShadowPlay demands enough space in hard drive and allows users to recompress or re-encode their recorded files as per need. The recorded collections can also be directly uploaded to YouTube where they will get automatically compressed, but those who usually work on smaller bandwidth rating are advised to re-encode prior to uploading. OBS is also good in this task as it compresses files automatically to assist in fast processing. The best idea is to use OBS for long sessions and terrible bandwidth ranges; whereas ShadowPlay is nice choice if you have great bandwidth. 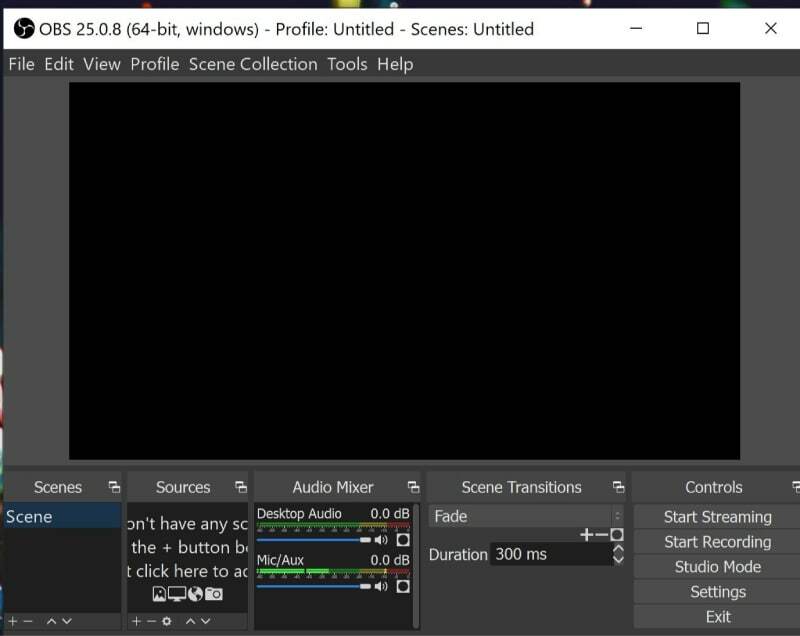 There is no doubt to say that OBS recorded videos take lesser space in your memory due to compressed format whereas ShadowPlay needs more space in your Hard Drive. Those who are curious to enjoy professional style editing must go for OBS platform because it allows them to access plugins, multiple scenes, collection of music tickers and alerts or notifications regarding all settings. On the other side, ShadowPlay can just offer you simple service for recording your gaming hour without additional interactive controls. It is not possible to enjoy Twitch streaming and Shadow Recording at the same time on ShadowPlay so most of the gamers love to use OBS to stream their content with ease. ShadowPlay is good for broadcasting needs but OBS offers great overlay adjustments. No matter which game your want to record on your PC, you will find extensive customization options on OBS platform but they are limited in case if ShadowPlay. Both these software tools are available for free and work for game recording needs but your selection completely depends upon your connection type and CPU power. As already mentioned that OBS can perform better even for low bandwidth connections too because it saved videos in compressed formats that can be easily transferred to internet or on other viewing platforms. But in case if you already have a good quality connection offering high bandwidth rating then it is advised to work with ShadowPlay because it can upload content even without much compression so that video quality stays optimized to crystal clear appearance. Also, having high performance CPU is an advantage for game players because it allows recorder softwares to work without any interruption and loading issues. The action games always need latest and high performance CPUs because they need fast processing for graphics. As you can avail both these recording systems for free so it is good to invest on high performance systems to avail best video recording services.